Adds Luxury Standard Brushed Nickel RO Faucet, Refrigerator Connection Kit, and Dow Filmtec 75 GPD high hardness RO membrane to the Home Master Ultra with Permeate Pump Under Sink Reverse Osmosis System. This Loaded Version provides additional solutions. Drought affected municipal water supplies have increased water hardness leading to early membrane failure. 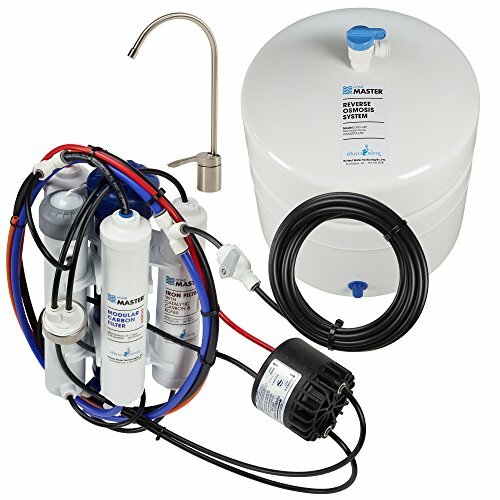 The Home Master Loaded Version RO systems feature the latest Dow Filmtec high hardness RO membrane for residential water supplies up to 18 grains per gallon. The new upgraded lead-free Luxury Standard Brushed Nickel RO faucet with 1/4-turn ceramic disk and 360-degree swivel spout is beautiful. Installing the RO faucet on traditional RO systems can be a hassle because of tight spaces. So, rather than forcing you to buy a specialized tool, a specially designed fastener tightened by hand is included. Plus, the fridge kit delivers purified water to fridge centers. The Home Master Ultra with permeate pump uses 6 stages of filtration, purification, and sterilization to produce outstanding clean water. It uses sediment, iron, catalytic carbon filtration, and reverse osmosis purification to remove up to 99% of iron, hydrogen sulfide, chloramines, chlorine, chemicals, chromium, lead, dissolved solids, light and heavy metals, and other contaminants. Then, the advanced ultraviolet sterilization chamber safely destroys 99.99% of microorganisms. Only the most sophisticated components certified to NSF standards are included in the design and construction of our product. The Home Master Ultra with Permeate Pump is the smarter choice for exceptionally pure, great tasting water. In the Box: Fully assembled purification unit with filters, 3.2-galllon storage tank, 3/8-Inch feed water adapter w/shut off, lead free Luxury Standard Brushed Nickel RO faucet w/adapter, TFC RO membrane, 110-volt power supply, drain saddle and instructions. BPA free. 5-year limited warranty.